The Environment Agency is beginning flood-relief work on the River Sowy, and other water-related levels stuff. I know this because we surprised them at it. I may have slightly made up a few things in this picture: there were workmen and diggers by the time we left, but I think we hid our tails better than this. Also, nobody actually had long hair or was actually properly naked, but that’s what artistic licence is for…. Couldn’t quite decide on colour or no-colour…. 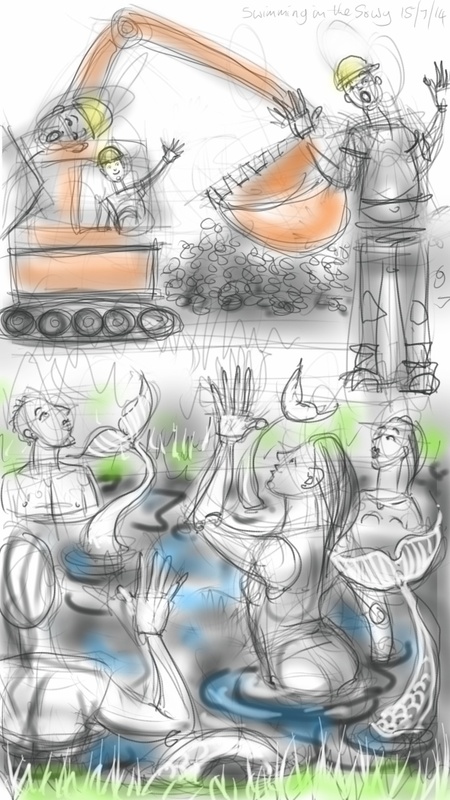 This entry was posted in Events, Fantasy, People, swimming and tagged art, digital sketch, drawing, Environment Agency, illustration, mermaids, River Sowy, swimming, tablet sketch, wild swimming on July 15, 2014 by Nancy Farmer.